Hello! I hope you are doing well! I am sharing a card that was inspired by day on Sunday. We started the morning off at the park for Worship in the Park where all of the churches in our little town come together for a joint service. The weather was gorgeous with a nice breeze. Then in the afternoon we spent time outside playing and again it was just a perfect day! 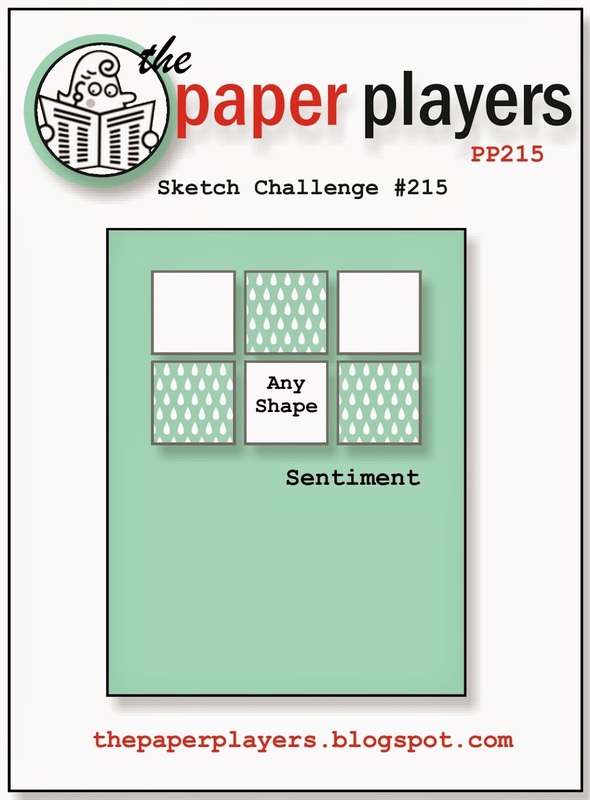 The layout for this card came from the Paper Players #215 sketch. I stamped several images from the Clearly Whimsy Happy Hello stamp set on to my image panel in the square pattern set up in the sketch. It's hard to tell but I added some glossy accents to the middle star to make it shine. 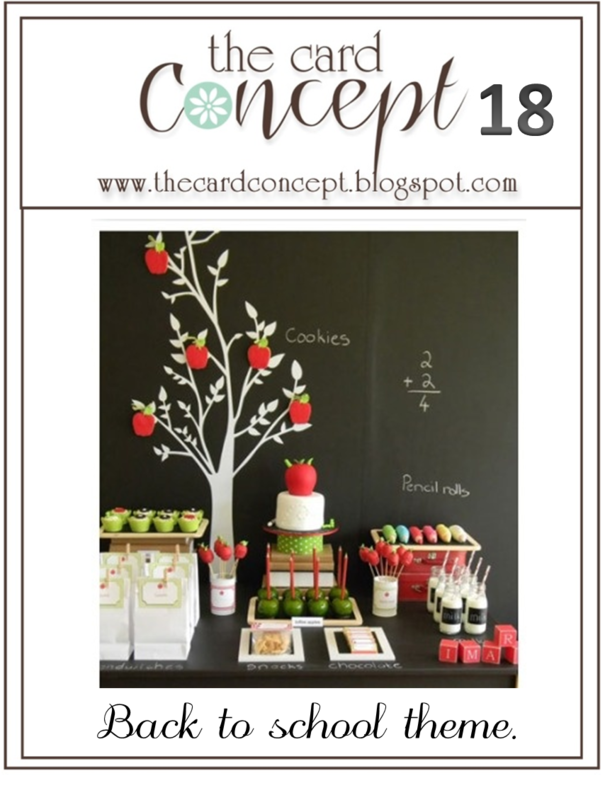 I chose to use red in my card for the Catered Crop Seeing Red Recipe Swap challenge. I kept this card very clean & simple. This is the sketch that I based this card on. 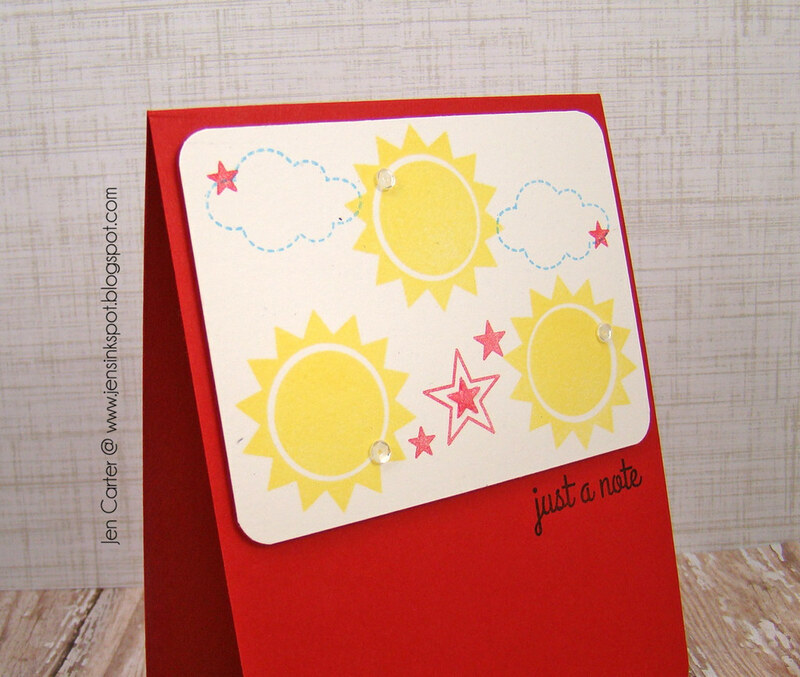 I am also going to link this up to the Simon Says Stamp Wednesday Challenge, Anything Goes. Hello! 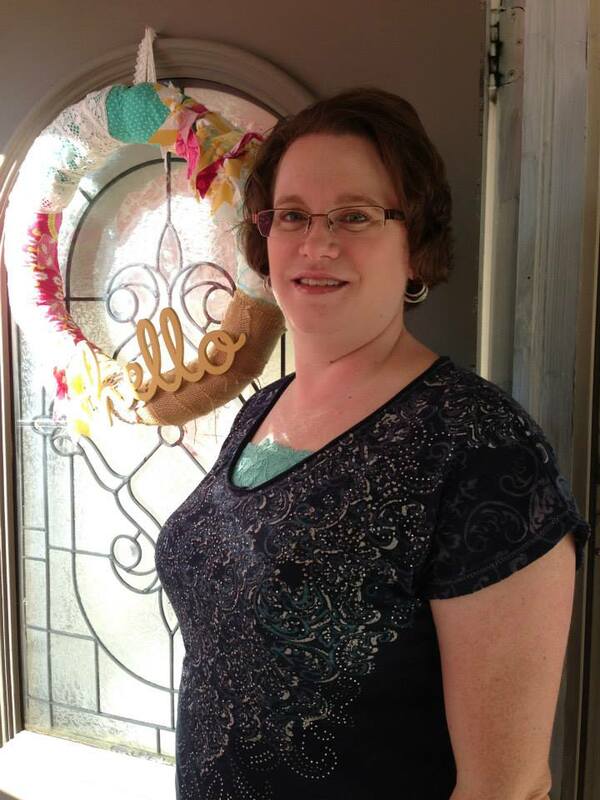 I am stopping in with my 2nd post today for the Coffee Lovers Blog Hop! If you'd like to take a look at my 1st post today, a hand made box with gift tag, you can click here. 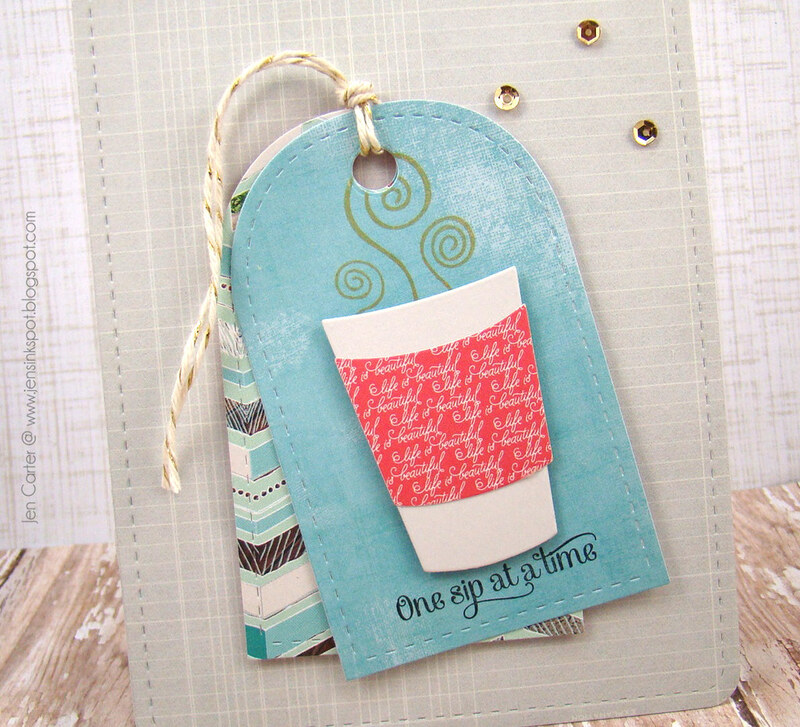 For today's card I used the Lil' Inker Designs Coffee Cozy stamps & Coffee Cozy dies as well as some other Lil' Inker goodies. 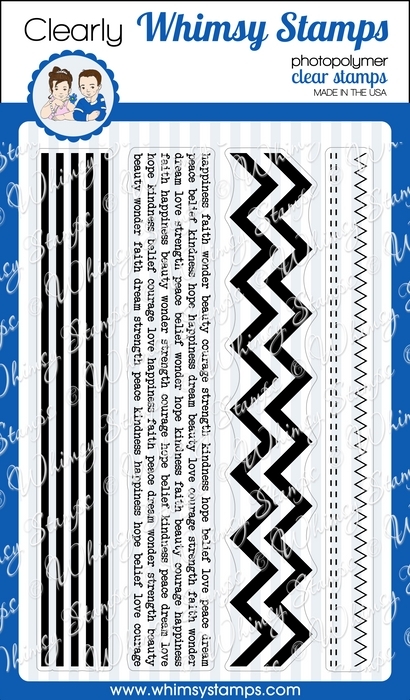 To create the tags I die cut two of the Anytime Tags. I stamped my sentiment from the Coffee Cozy stamp set and then also stamped the steam in gold ink. I attached the coffee cup & cozy with dimensionals. I adhered the set of tags onto my card base that was cut with the new Lil' Inker Stitched Mats Rounded Rectangles. 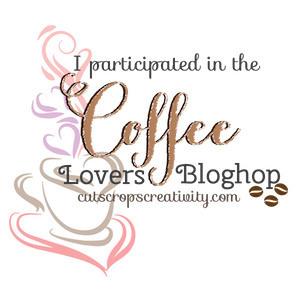 If you'd like to play along with the Coffee Lovers Blog Hop, there are lots of prizes up for grabs, including loot from Lil' Inkers! 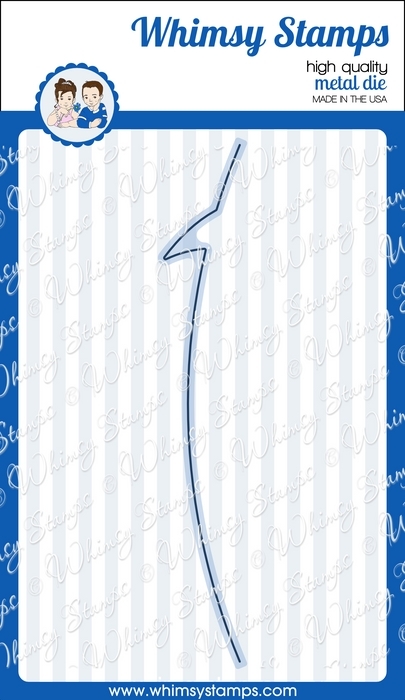 You can link your coffee themed card here until 11 PM CST. 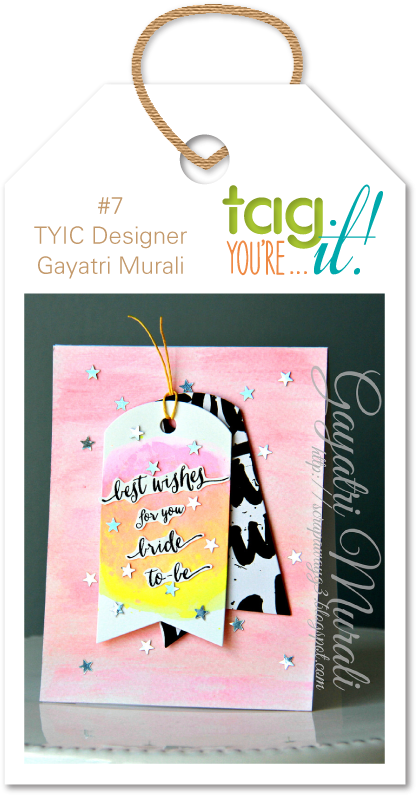 I am entering this card in the Tag You're It challenge #7. I'm also entering this over at the Pink Elephant for their Anything Goes challenge. As you know I had the pleasure to spend last weekend with a bunch of terrific crafty girls. We were each suppose to bring a gift and to wrap it in cute packaging. I didn't have the right size of box so I decided to make my own! 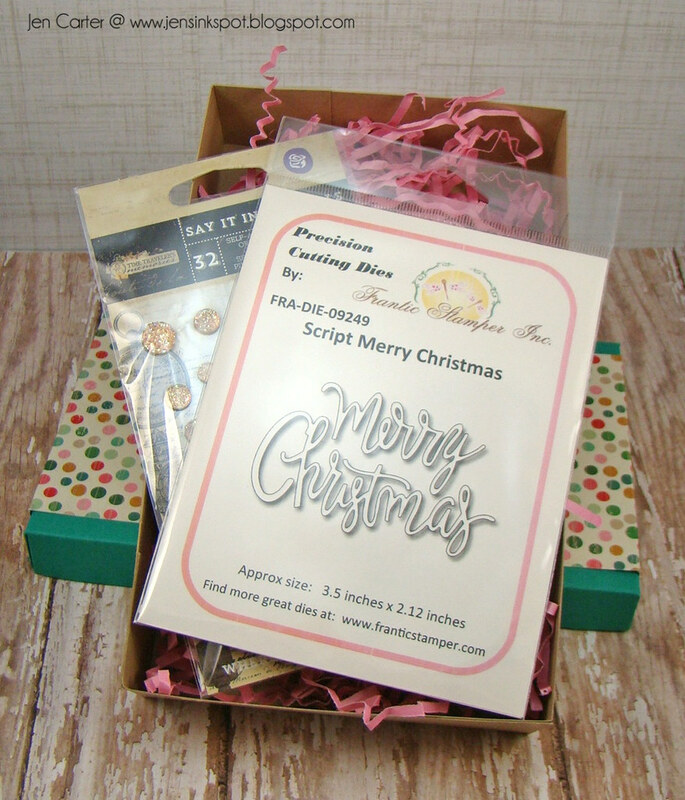 I used my Scor-Pal to create the size of box I needed following this basic template and adjusting it to the size I needed to fit the items I placed inside. I wrapped a colorful patterned paper band around the lid. 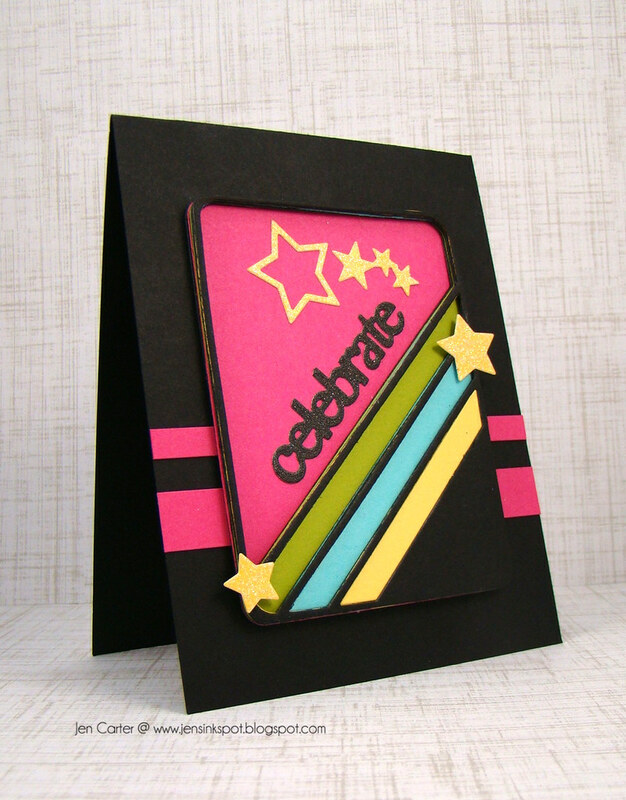 To make the tag I used one of my favorite dies from Frantic Stamper called Diagonal Stripe 3x4 Photo Card die. To make this tag a little thicker and to more easily attach the various pieces, I first cut the tag with chipboard with a sandwich that didn't allow the die to cut completely through. I then trimmed around the outside edge with a knife. 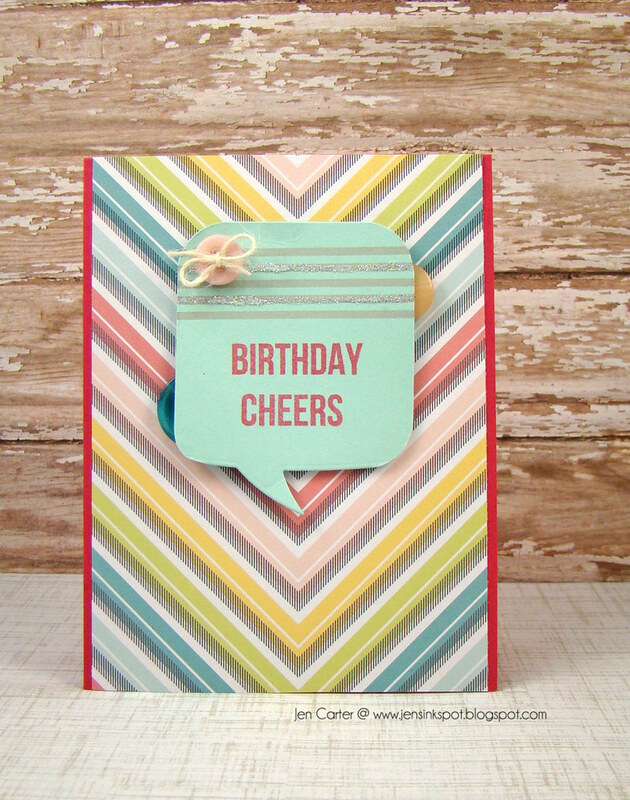 I picked coordinating cardstock for my frame and stripes and attached them to the base. The "happy" was heat embossed with gold embossing powder. I punched a hole in the top of the die cut piece to make it a tag and tied it on with a little bit of gold wire wrapped around the canvas bow. When the box was opened this is what was inside. 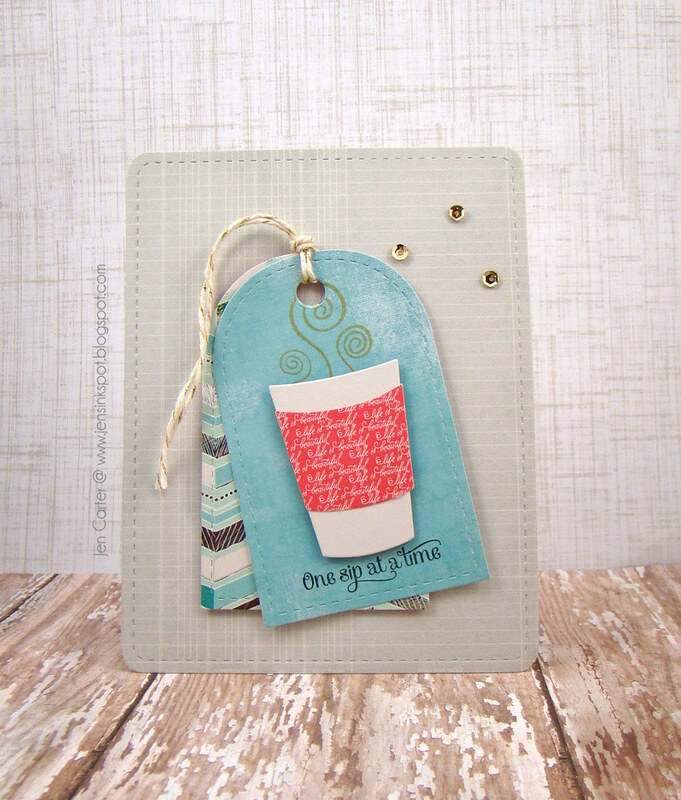 This die from Frantic Stamper is another one of my favorites!! 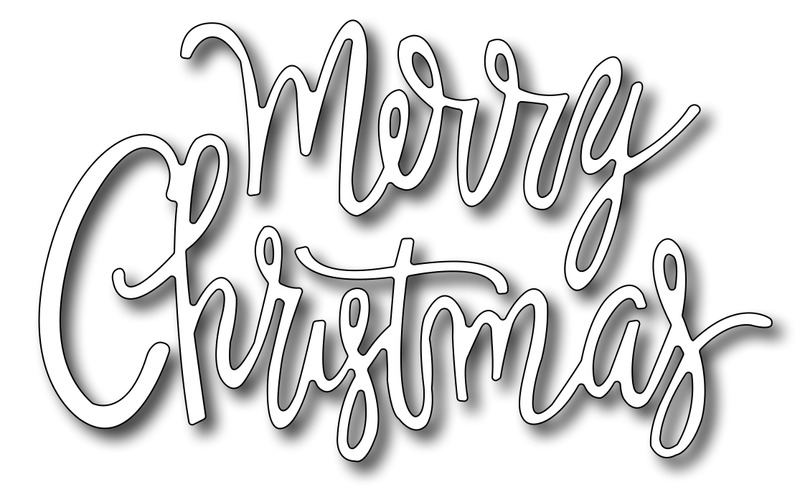 It is called Script Merry Christmas and it is gorgeous! My make & take for the weekend used this die too! Here's one more view of the complete box. I LOVE finding ways to use my dies in out of the box ways! Can you imagine how cute these would be on Christmas presents? 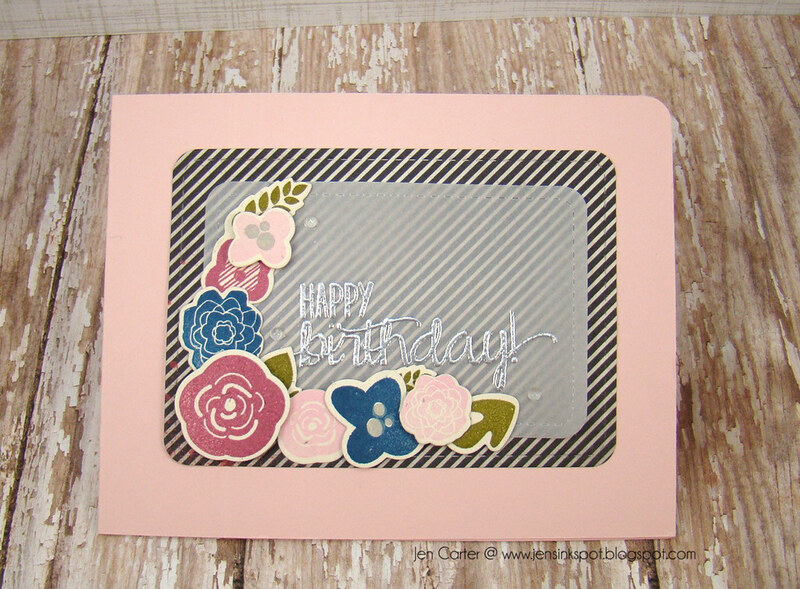 Well, I've told you before that I need to add some more birthday cards to my stash so today I am back with a birthday card I recently made using Clearly Whimsy stamps! I used the Speech Bubble Border die to create my bubble. I cut a rectangle to the size I wanted and then used the border die to cut the bottom. 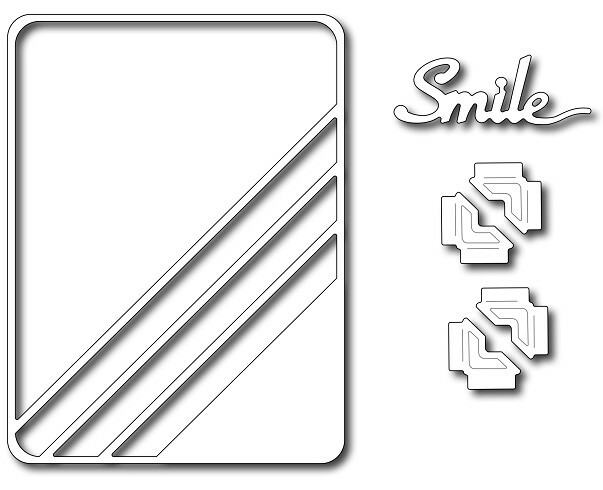 I rounded the corners with a corner rounder. I stamped the sentiment from the Say What? stamp set. I finished the bubble off with stripes from the Basic Background & Border stamp set and added glitter on a couple of the stripes. Hey everyone! 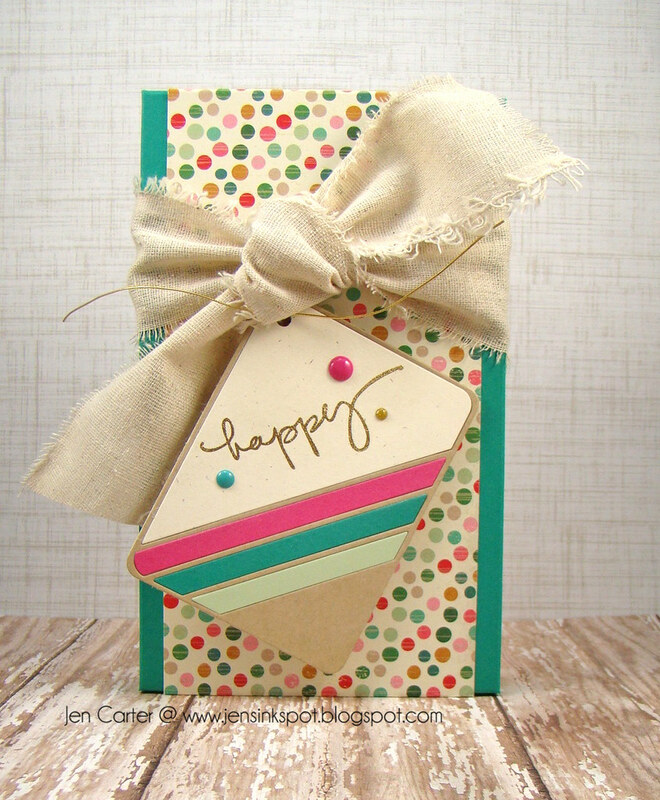 I am just popping in real quick today to share a card for the PTI September Blog Hop. I loved the inspiration photo that Nichole gave us this month. It was gorgeous! I used the colors from the photo as the inspiration for this card. 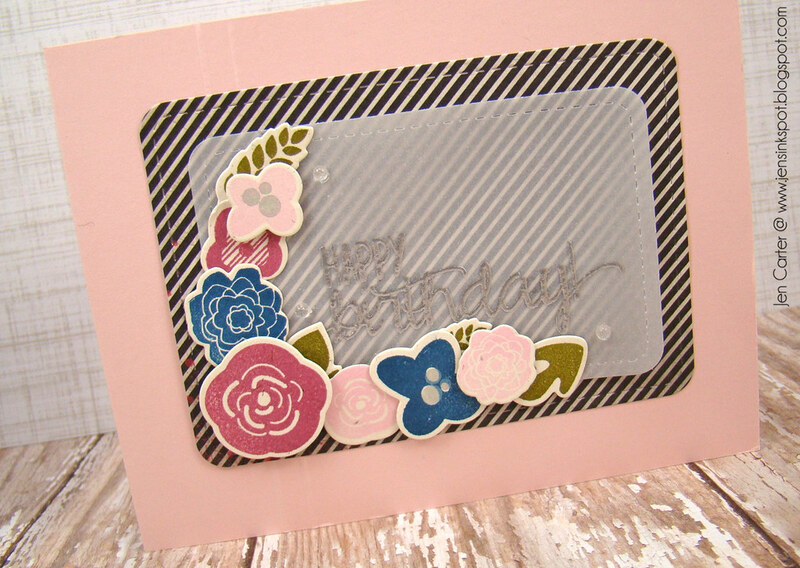 I knew when I saw the silver bucket that I had to use silver embossing powder on my card! It was very hard to capture on camera, but I love the way it shines! I used the new LID Stitched Mats Rounded Rectangles for my frames. It's hard to see but I also scored two lines on the left side of my card base with my Scor-pal. Thank you for stopping by! I hope you enjoyed the card! You can see all of the other participants on Nichole's blog. Hey everyone! 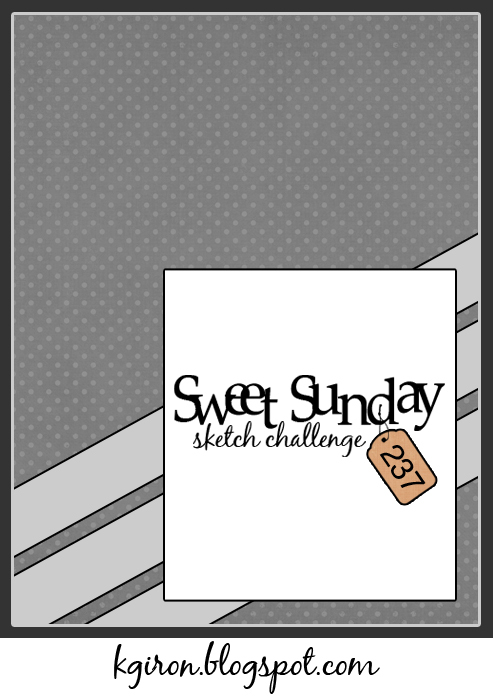 I wanted to play along with the newest Sweet Sunday Sketch Challenge #237. I went bright for this one! I added a lot of layers to make this card but I think it turned out pretty fun! I cut the Diagonal Stripe 3x4 Photo Card from Frantic Stamper 9 times to make my frame. It sounds like a lot but it cut out quickly. This is how I stacked the frame: black on bottom and then going up toward the top it was pink, black, green, black, blue, black, yellow & I finished with another black one on top. I had a really hard time photographing the dimension but with each colored layer I stair stepped the layers so that each color was farther toward the top. So, when I added the pink layer it is way on the bottom of the stack. When it was time to add the green stripe it was stacked on top of 4 layers so it was closer to the top than what the pink layer was. The blue layered stripe was stacked on top of 6 layers and the yellow layered stripe was stacked 7 high. I thought it was fun how you can see the colored layers in between the black layers. 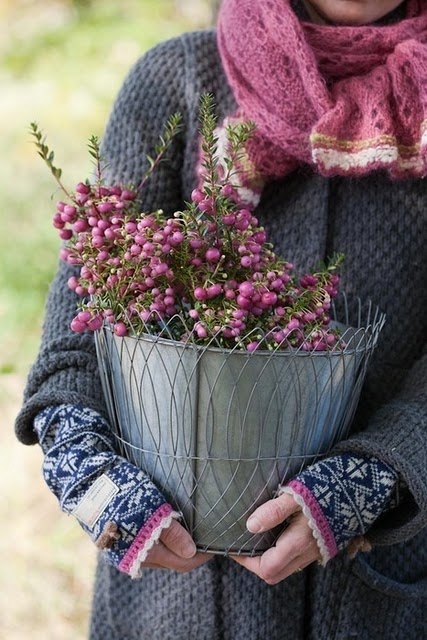 Adds just tiny pops of color in unexpected places and adds dimension and texture. 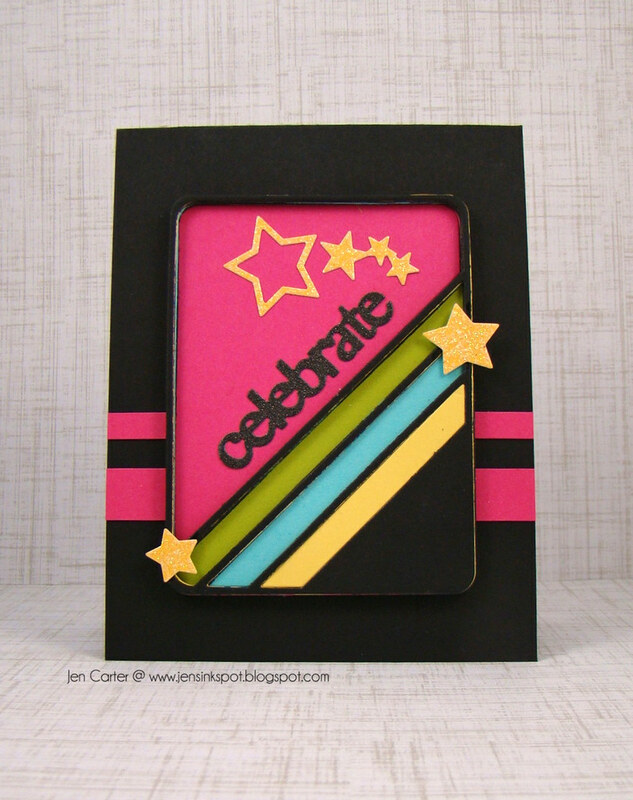 The glittery celebrate and stars are from the Stars & Stripes Photo Card, also from Frantic Stamper. Oh my word!! I had an awesome weekend! 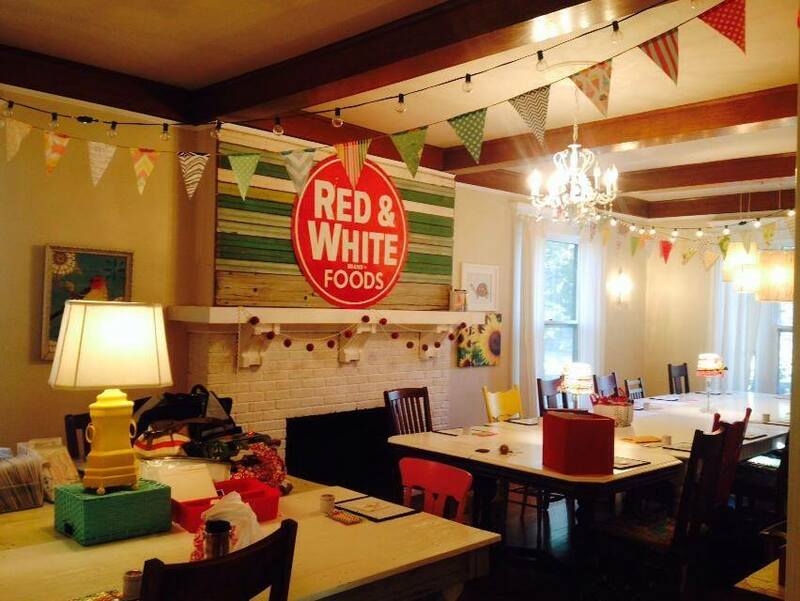 I went to a crafty retreat with 15 other fabulous women and it was amazing! I wanted to share a few of the pictures from our weekend. This is the house. An old Victorian like house. On the inside though it's like an old farmhouse! I've driven by this house hundreds of times and never would have guessed what it was like inside! Here I am entering the house. That wreath on the door was so cute! This is the dining room! There were little hand made banners in almost every room in this house. LOVED them! This is the bedroom I slept in. There were 5 bedrooms all with twin sized beds in them and covered with colorful quilts. This is where we stamped. How could you not be inspired? This hutch was one of my favorite things in the house! It was filled with color! Backyard. Yeah, so very, very cute!! Even cuter when the strings of lights were on! Here is a shot of the girls from our Crafty Peeps group. Love them all! Here are the girls that were there from our Lil' Inker Design Team! It was so fun to meet Laura & Erin in real life! And of course I always love getting together with Amy! And last but not least our group shot! Thanks to a great Stamping Away 2014 weekend ladies! Hey everyone! I am getting ready to head to a crafty retreat this week and I am getting so excited! My problem? Trying to figure out what to bring and what to leave behind! It's been a while since I've gone away to stamp with friends and this time I'll be meeting some "old" friends and some crafty friends that I know online, but have never met in person! How fun! I can't wait! 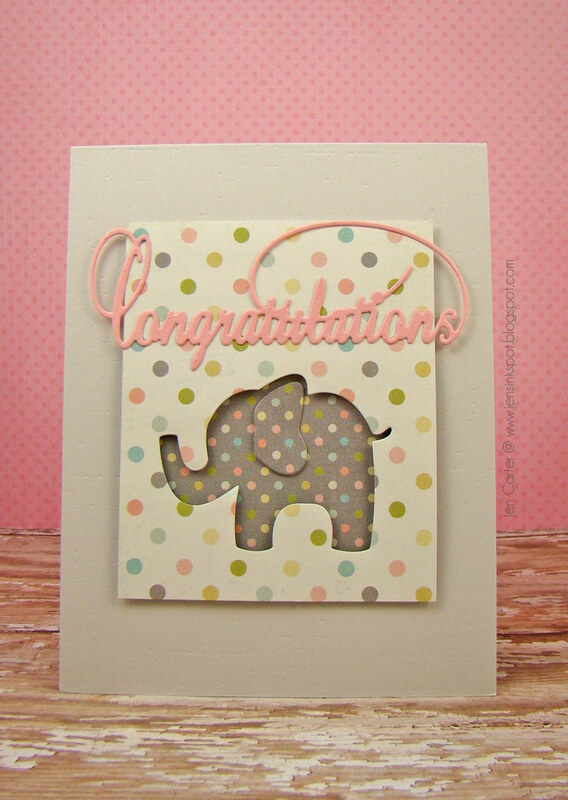 Today I am sharing a card for the Pink Elephant Technique Challenge which is to emboss somewhere on your card. I was in a watercolor mood so I pulled out my Clearly Whimsy Distressed Backgrounds stamp set and went to work. I used only one of the stamps from that set and stamped it repeatedly in different colors of pastel ink. I then flipped the stamp the other direction and stamped a very light gray (Amuse Pebble) to create an almost watermark feel. One of the brushstrokes I embossed in gold. I really like how this turned out! 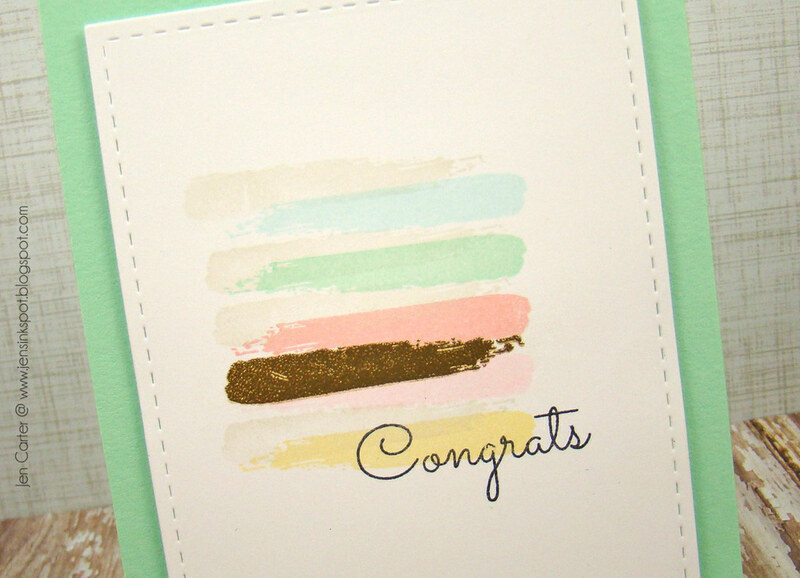 The Congrats was stamped with black ink and is also from a Whimsy set called School Spirit. 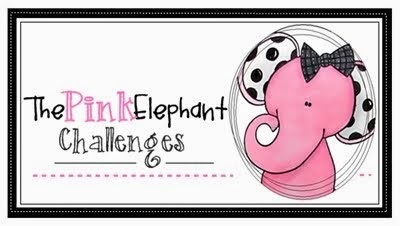 You can play along with the Pink Elephant Challenge until Sunday! Thanks for visiting! Hey everyone! I hope you had a nice weekend! As you know Fall is here! It's been so nice this weekend and we've been enjoying the cooler weather! With Fall comes some traditional Fall foods, activities and decorations. One of the things I've been seeing plenty of lately is candy corn. I'm not a huge fan of candy corn but my family is! 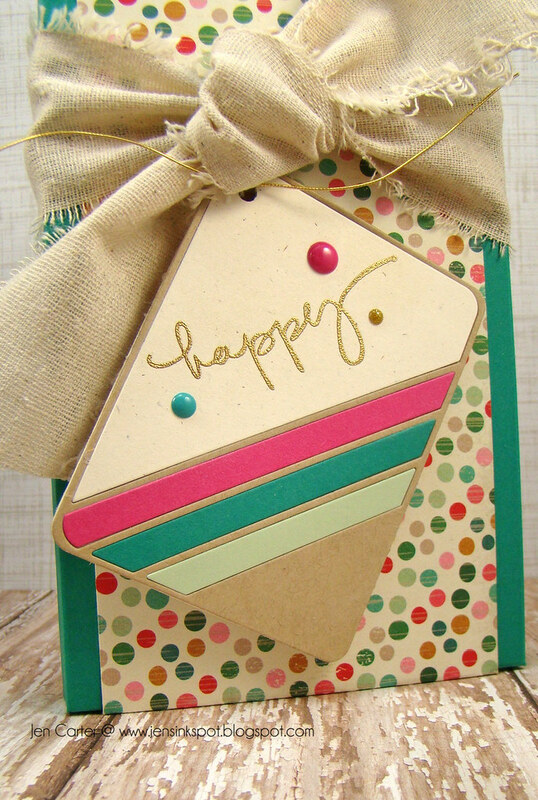 I started by using the Diagonal Striped die to cut some thin chipboard. I used a piece that wouldn't cut all the way through with the sandwich I created and this created a nice base that I could paper piece the rest of the pieces together. I next used the die to cut a piece of yellow (and later added yellow glitter cardstock), orange & white cardstocks. I cut each piece a part in sections and then adhered them to my chipboard base. 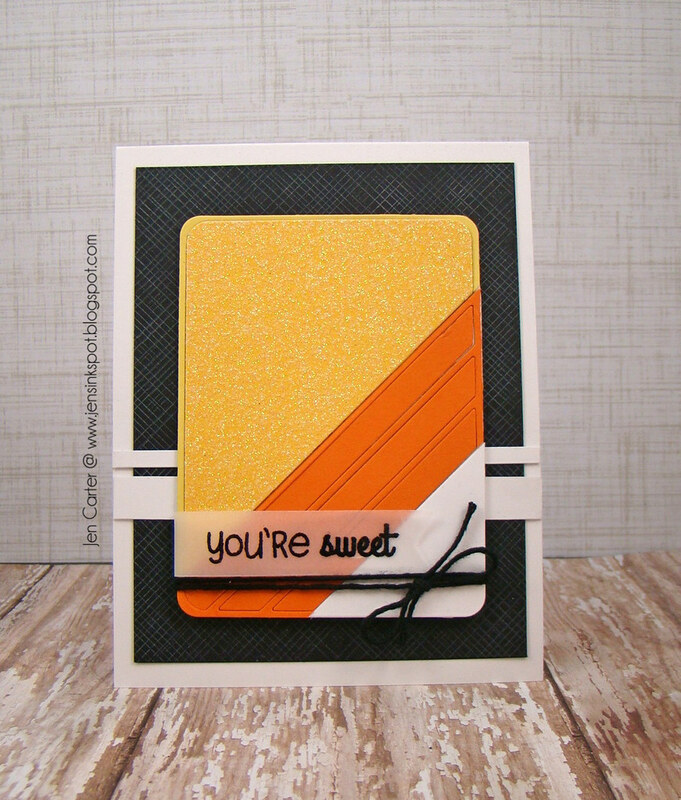 This created a nice candy corn look for the card. I added a vellum banner for the sentiment and gave it a little dimension by not adhering the left side down but letting it sort of "bubble" up. I also added some twine and a few pieces of white cardstock to finish the card off, give it some visual interest while still keeping it simple. It's starting to feel like Fall here! The temperature dropped earlier this week and the air is a lot cooler! I hope we get to enjoy true Fall weather for a while before we move into the cold days of Winter! With the Fall temps in mind, and the fact that gift giving isn't too far away, I have a cute gift card holder to share today! 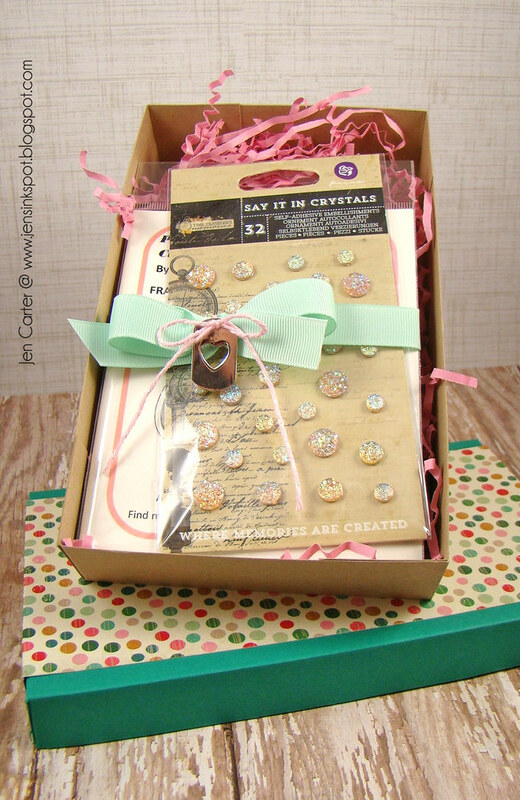 I used the adorable Lil' Inker Designs Give a Hoot Gift Card Holder die to create this. I love owls! I pulled out some coordinating patterned papers from Heidi Swapp's Serendipity paper pack. Instead of inserting a gift card into the inside of the owl, I cut a piece of cardstock to the appropriate size and left a place to write a note to the recipient. Super easy and fast to put together! I love that this die includes all of the pieces you need to put this together easily! Thanks for stopping by today! I hope your day is full of blessings! It's hump day!! Yeah for Wednesdays! I'm excited because tonight my 12 year old son and I are heading to the Kansas State Fair to take in a Matthew West & Cloverton concert! It's his first concert and I hope he enjoys it! I've always loved attending concerts so it's extra special to get to take my son with me this time! On to the card. 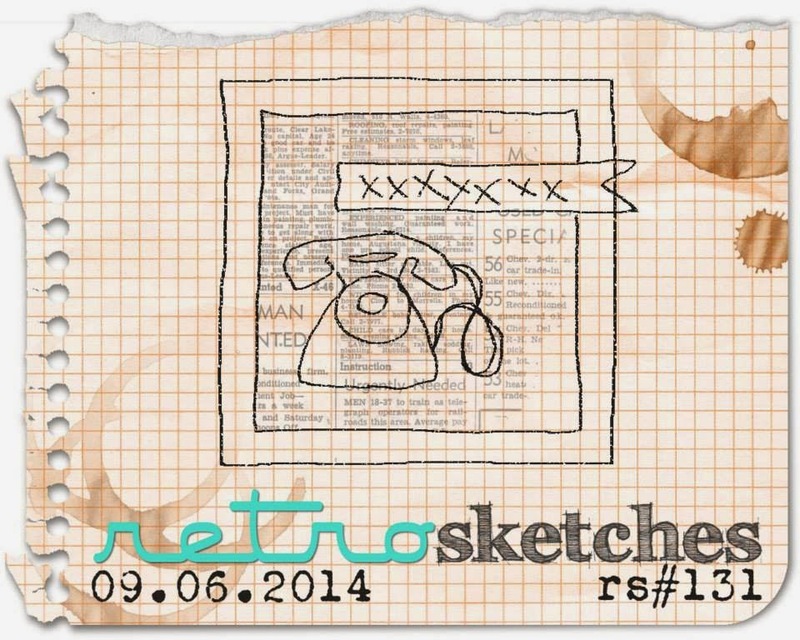 I played along with this week's Retro Sketches challenge #131. The challenge called for a square card but I went with a regular A2 sized card instead, changing it up just a bit so I could make my images fit. 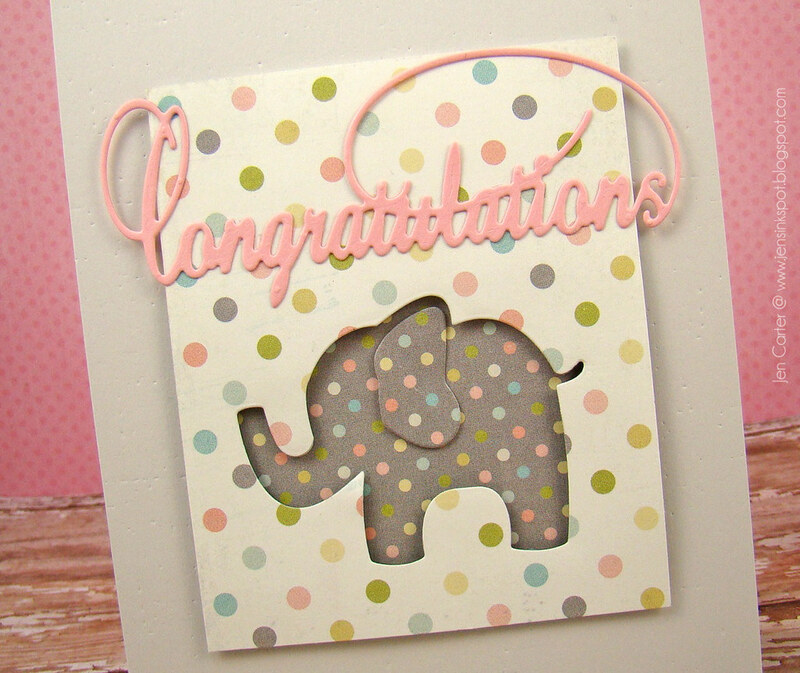 I used the cute elephant from the Frantic Stamper Baby Animals die set to cut the image from my patterned paper. I LOVE the animals in this set...so cute! I then popped that panel with the negative die cut up with dimensionals and adhered the elephant ear inside on the coordinating piece of patterned paper. 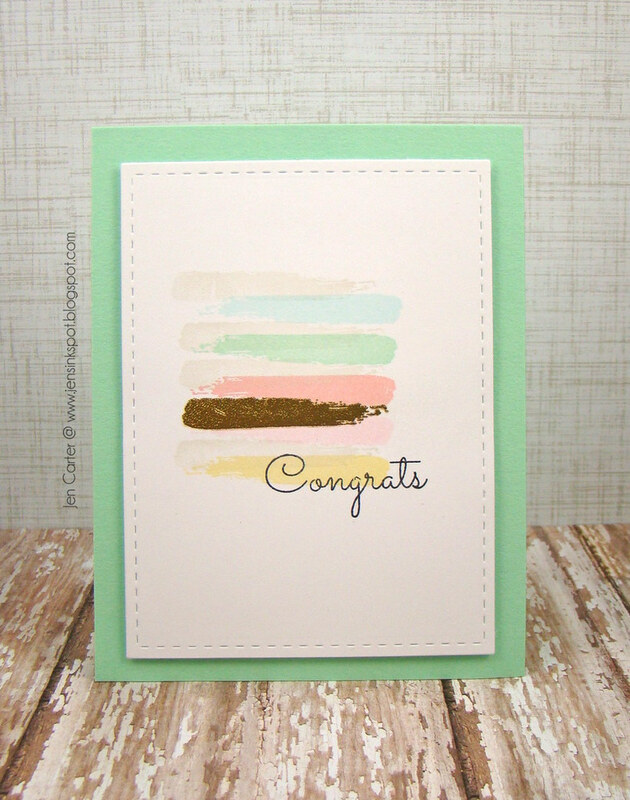 I used the Congratulations from the Frantic Stamper Accolades die set for my sentiment. Isn't that scripty sentiment great? I really like that font! 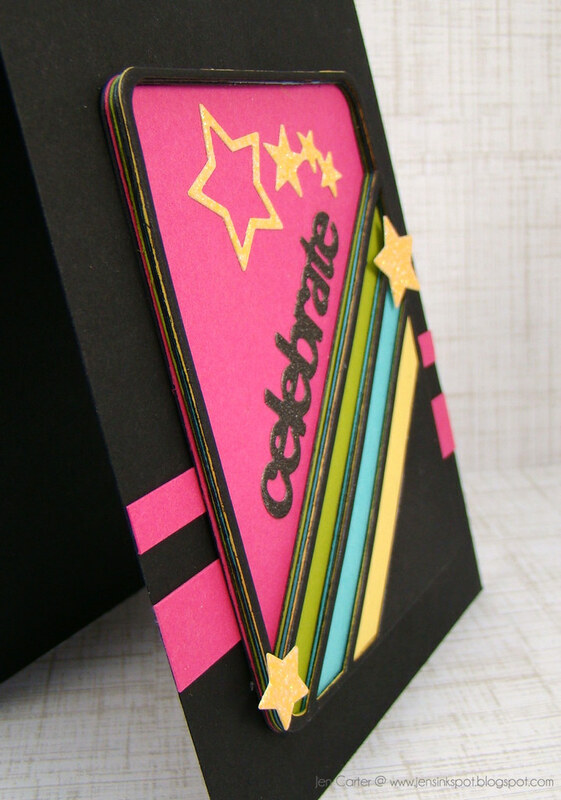 This card came together so quickly and would be easy to reproduce! 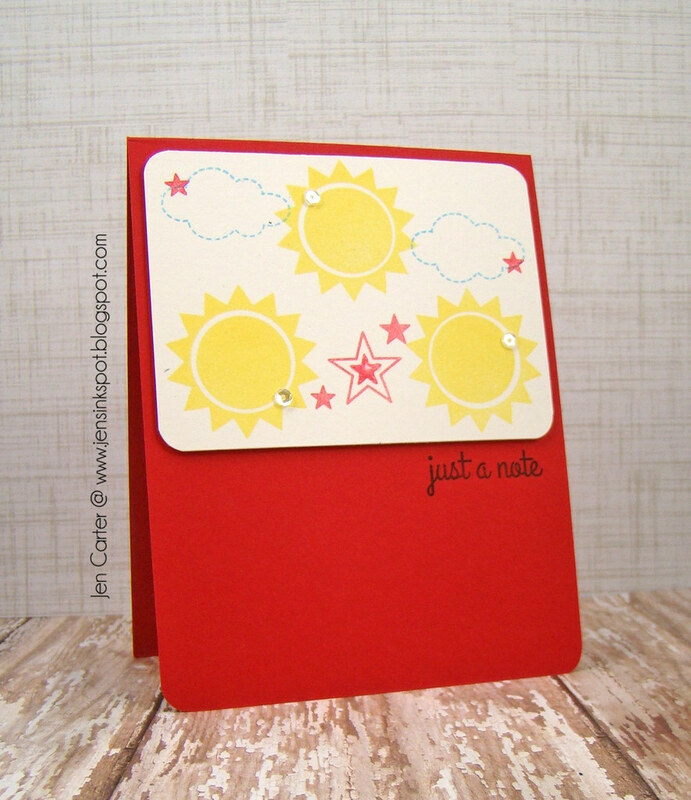 I pulled out a couple sets from Clearly Whimsy Stamps because they are perfect for school cards. 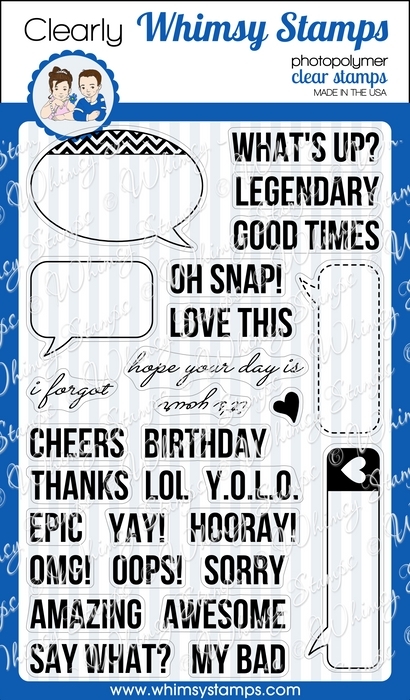 I used the Clearly Whimsy stamp sets School Spirit & Say What to create my speech bubbles & sentiments. 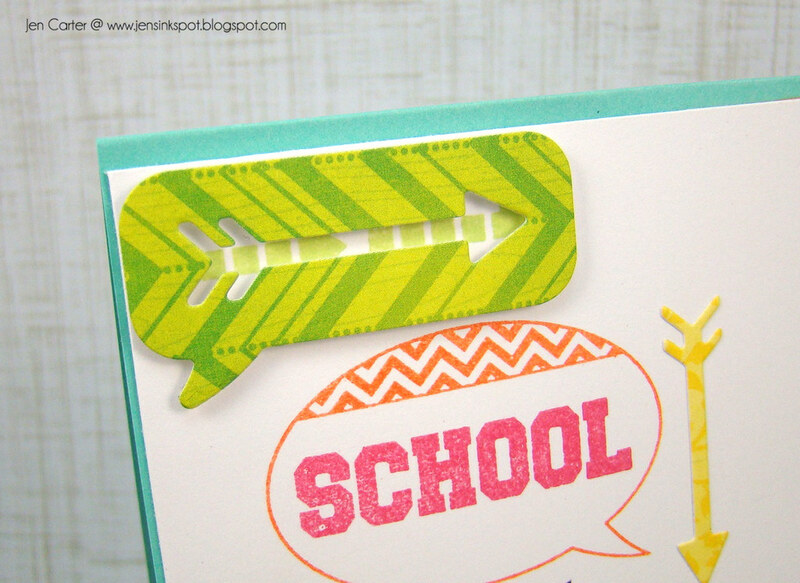 I stamped one of the arrows twice from the School Spirit set inside of the green bubble at the top and then placed the speech bubble die cuts from the coordinating Say What Speech Bubble die set over the top with dimensionals. I love how you can see the arrows peeking through to create even more visual interest! I did a similar thing with the bottom speech bubble. 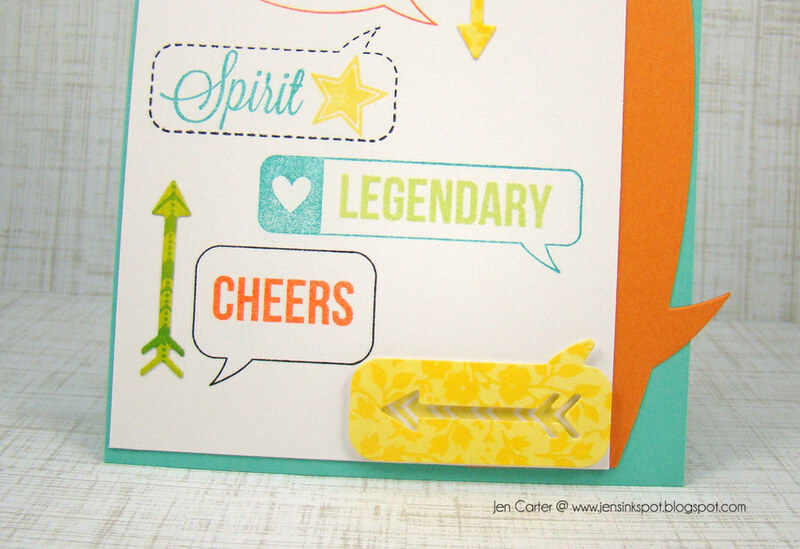 This time I used a larger arrow from the School Spirit stamp set and then placed the die cut bubble on top. 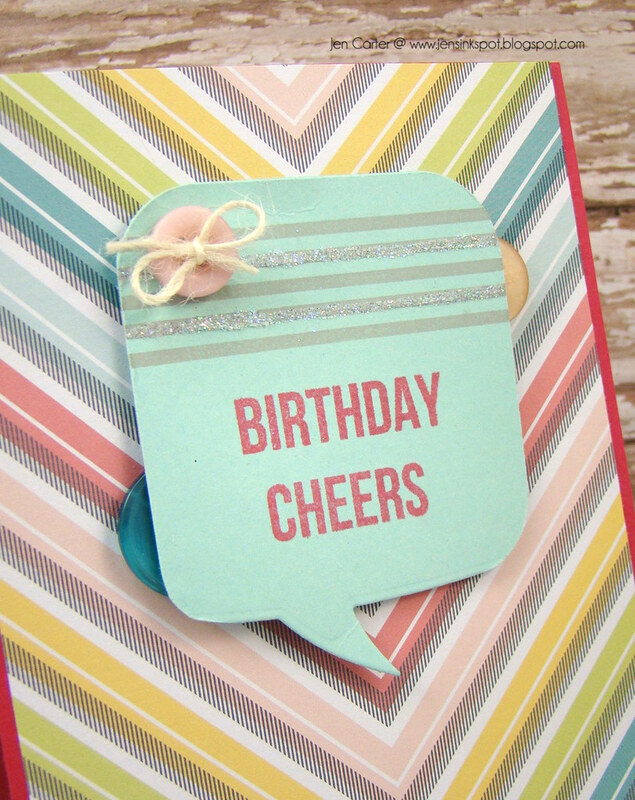 I also used a new border die, the Speech Bubble Border die, as a border on the side of the card to fit the theme. 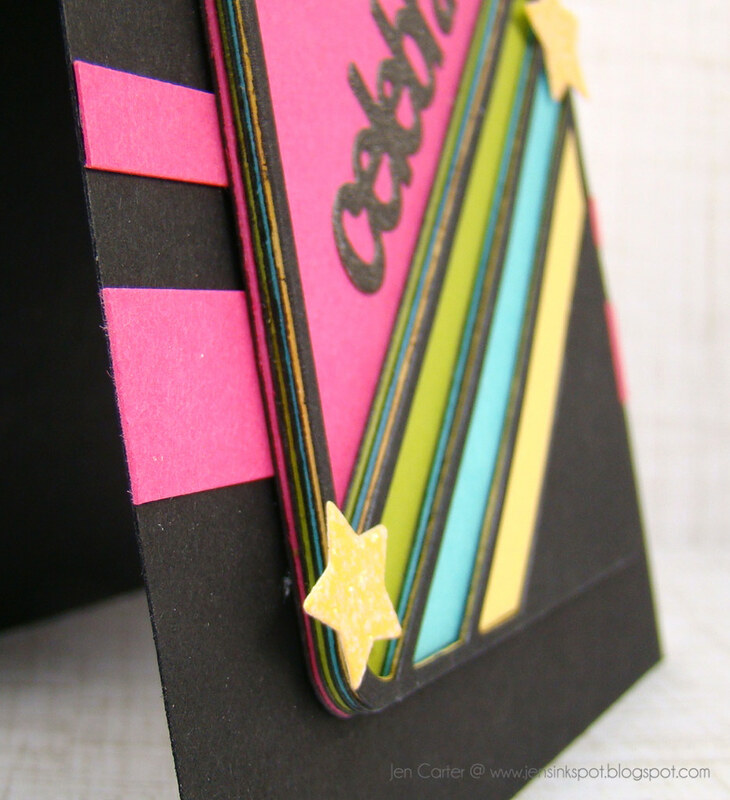 I let it hang slightly over the edge of the card for a fun look. I'm suppose to share what card style I used too. I'm terrible at figuring that out though! Clean and Graphic? Clean and Layered? Not sure!